Nasdaq 100- Bearish reversal at double top in play? Both charts above are the Nasdaq 100. Monthly on the left, weekly on the right. 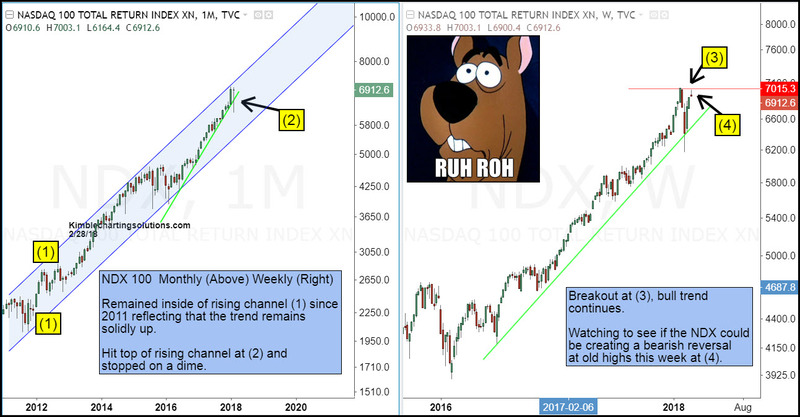 NDX hit the top of rising channel (1) in January and stopped on a dime. Soon after it declined 10%, then reversed higher after hitting rising support at (2), which has been in place for the past 2-years. The weekly chart highlights that the NDX this week is back testing all-time highs at (3). With the trend being up, bulls would love a breakout of old highs. For sure, bulls do not want to see a bearish reversal at old highs and then a break of 2-year rising support that held earlier this month.